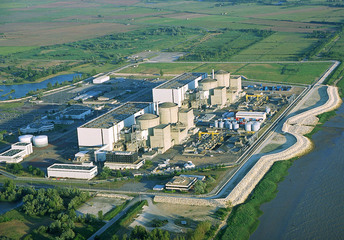 A nuclear power plant threatening the Gironde. In December 1999, strong winds produced a sudden rise in the waters of the estuary and the flooding of part of the plant. Risks have not been suppressed. The Blayais nuclear power plant is a nuclear power generation center located near the town of Blaye, not far from Bourdeaux, in the heart of the Blayais marsh, in the town of Braud-et-Saint-Louis, on the edge of the Gironde. In service since 1981, it is managed by Électricité de France and produces electricity that is injected into the French electricity grid. It is cooled by water from the Gironde estuary which is pumped via underwater pipelines. As early as 1998, the annual safety review of the Blayais power station indicated the need for a 50cm rise in the dikes, but EDF deferred this raising of its protection dike. On 19 November 1999, EDF was ordered to produce a safety work schedule by a letter reminding it to order. On December 27, 1999, the strong winds produced by the storm Martin caused a sudden rise in the waters of the estuary and the flooding of part of the plant. An overvoltage on the electrical network will first cause the emergency shutdown of reactors 2 and 4. Later, debris carried by the flooded Gironde obstruct a cooling pump reactor 1, which is also put into operation emergency stop. The fourth reactor was shut down as part of normal maintenance operations. The incident was rated Level 2 on the INES scale. Since 2000, EDF has invested more than 100 million euros in various works to remedy this problem. Since 1999, the Tchernoblaye association has been working in Gironde to demand the closure of the Blayais nuclear power plant. In 2002 and 2003, EDF declared two generic level 1 incidents on the INES scale, relating to the earthquake resistance of the components of the Blayais power station. Nowadays, the environmental activists associations Tchernoblaye and Greenpeace or “Europe Ecologie les Verts” have deployed signs and banners in the Badinter amphitheater of the departmental council of the Gironde (DCG), where was held the public meeting of the “CLIN” (local commission of nuclear information ) to protest against the four reactors of the Blayais power station which have 15 irregular pieces. But the Nuclear Safety Authority has validated the continuation of its activity. Patrick Maupin, representing Greenpeace at the office of the local commission for nuclear information has made the request to attend the inspection of the Nuclear Safety Authority of Blaye. After a first refusal from EDF last March, the representative of Greenpeace at the local Nuclear Information Commission to participate in the inspection visit of the Blayais power station by the ASN (Nuclear Safety Authority) is a second refusal. In spite of the numerous attempts of Greenpeace, Tchernoblaye as well as of the "Europe écologie les Verts " (EELV), this nuclear power station in activity. However, it represents a real risk for the entire European population, indeed, in case of explosion, several million Europeans would be irradiated. Because of its proximity to the Atlantic Ocean, the underwater fauna would also be strongly impacted by this disaster. Project Details Its four reactors has 951 MW of ower each, and produce around 27 TWh per year meeting 6.15% of French consumption and 1.2 times the electricity needs of the Aquitaine region. Since it was commissioned in 1981, the Blayais nuclear power plant has produced 674 billion kilowatt hours. In 2011, it produced 25.9 billion kWh. Investments to diminish the risks have costes over 100 million euros. Why? Explain briefly. Some associations are trying to stop the project but for the moment there is no solution that had been found.